A babies foot is a very precious thing. They are a very different shape to an adults and ever so soft. They need to be cared for in the best possible way, and studies have shown that walking barefoot is the best thing for their development. Of course this is not always practical. Dylan is starting to try and pull himself up, and loves standing holding onto my hands. It won't be long until he is off and when we are outside I need to protect his little feet. 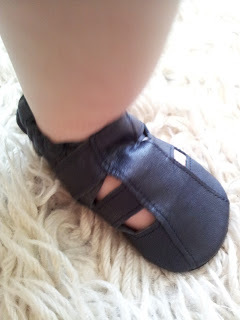 Skeanie baby shoes are leather with a suede sole, meaning they allow your child to walk naturally, as if they were barefoot whilst protecting them at the same time. pre-walkers and those starting out on their first steps, and this follows on to a junior range for older children. When Skeanie offered to send me some shoes, I was excited as I have been looking forward to picking Dylan's first pair of shoes for quite some time. 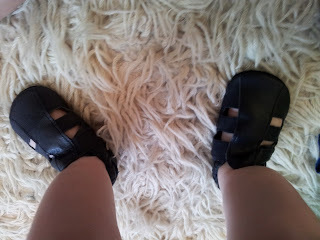 I chose a lovely pair of blue sandals in the hope that we would soon be having some summer weather and there has finally been a chance to test them. 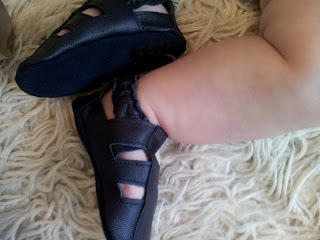 The shoes are easy to put on, and try as he does the little dude cannot get them off. This pleases me very much as I am on a constant watch for him throwing things out of the pram and I need to know his shoes will stay on. They are very soft all over and have plenty of space in them for his wiggly toes. It feels like he is growing up so fast, and seeing him in his little shoes is confirmation of this. I am excited about embracing the next phase of his development though. I look forward to his first steps, and watching him toddle around the park and I think these shoes are the perfect pair for him to do that in. The sizing chart for the Skeanie shoes has to be printed so that you can measure your child's feet which was a bit of a hassle for me as we don't have a printer, but did mean a very accurate measurement. The range of shoes is great as they have several styles, from boots to trainers to sandals and it was a difficult decision deciding which ones to choose. Disclaimer: I was sent a pair of Skeanie shoes for the purpose of this review. All thoughts, photos and opinions are my own.